Posted in Uncategorized on March 28, 2019 by admin. Keith Nosbisch roared to his third consecutive Pro Late Model victory while Studio Red Gladiator racer Kever Raulerson once again came from the back of the field to capture his third feature in as many weeks. Nosbisch, who picked up a heat win to start the night, started the 30-lap main from outside row three, joined by heat winner Phillip Cobb. At the drop of the green, Travis Varnadore vaulted out front and managed to put some distance on the challengers behind. Soon, Steve Mathis Jr. would emerge to give Varnadore something to worry about, but ultimately it wouldn’t matter. As the field headed for the end of lap 5, Varnadore slowed to a stop in turn four and his race ended at the point. Mathis took the lead that he had had momentarily before Varnadore’s troubles and set the pace. Meanwhile, it would be Nosbisch who would be doing the chasing. In just a few laps, Nosbisch was able to sweep by to grab the lead on lap 8. Mathis wasn’t done. Three laps later, he would make the pass to get the top spot. In four laps, though, he would be looking at the rear of the Nosbisch Rocket, a view that would not change though the distance between first and second did expand. For Nosbisch, it marks the third consecutive feature win and (counting heat races) fifth consecutive victory. In the Studio Red Salon Gladiators, the previous feature winner is destined to start at the rear. For the second time this season, that was the fate of Kever Raulerson who found a field of 16 others in front. Early race leader Dustin Wilson, celebrating his 18th birthday, was tenacious in his defense of the top spot. Many tried, but no one was able to sneak past throughout most of the race. Meanwhile, Raulerson managed to keep his car on the absolute bottom of the track to march forward. A mid-race restart saw a four-wide position battle take shape with Raulerson shuffled back out of the top five. The remaining laps became a mission as Raulerson was able to secure positions until he closed in on Wilson. Raulerson was able to get by and hold on for his third straight win. Wilson unfortunately lost power coming to the checkered and yielded seven spots to finish outside the top five. Logan Casteel and Kyle Bowman started the night with heat wins. 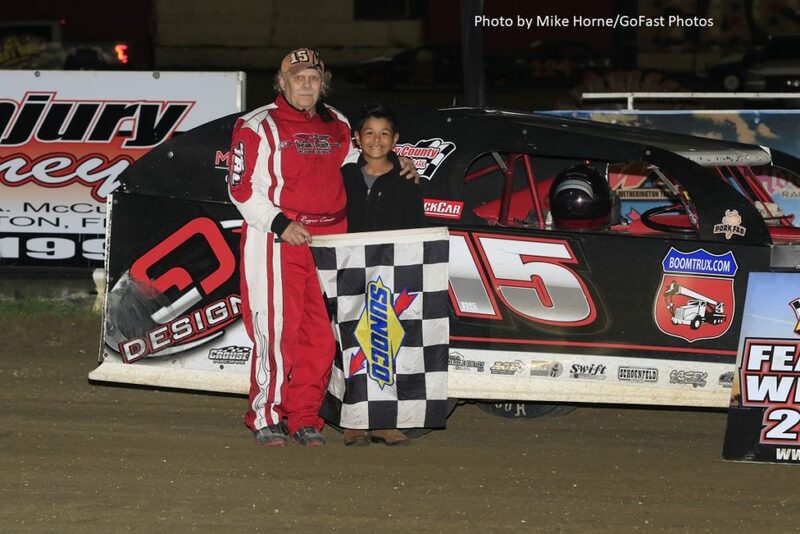 Austin Sanders returned to Victory Lane with a convincing run in the Gagel’s Modifieds. Sanders had to deal with constant challenges, first from Garret Stewart and then from Billy Howard. To get to the front, Sanders used the high line, but the track changed and the veteran wisely abandoned that spot for a faster groove. Sanders grabbed the lead on lap 4 of the 15-lapper. Dale Kelley recorded the heat race win. The Dirt’s 4 Racing Street Stocks always provide thrilling competition and tonight was no exception. 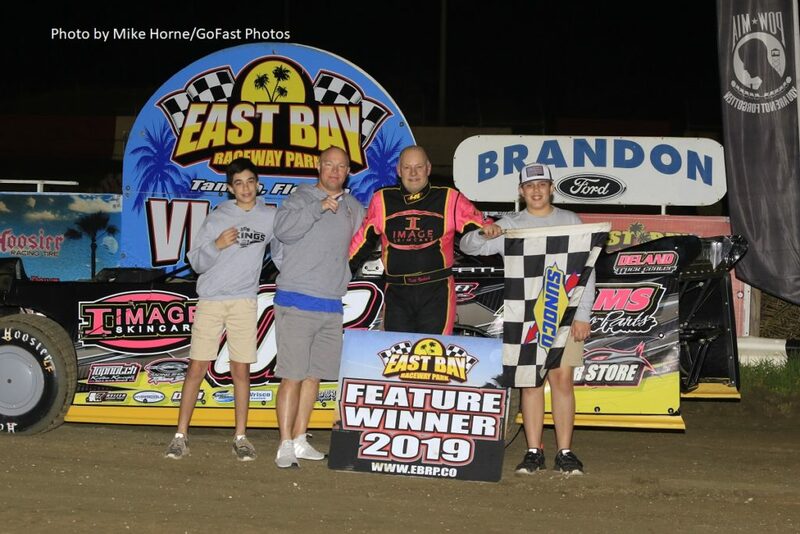 East Bay 2019 feature winner Nick Hebrank opened the 20-lap main by scooting out to the lead. A lap two spin by Scotty Kay Jr. bunched the field for a restart. Tim Gay and Thomas Pratt had a nice battle for the runnerup spot behind Hebrank that eventually saw Gay prevail. Gay then moved to the lead on lap nine, but it would be short lived. Pratt took over for the first time on lap 11, becoming the third different point setter. Through subsequent restarts, Gay could not catch the leader while Scotty Kay Jr. rebounded to claim third. Results of the Dirt’s 4 Racing Street Stocks event listed are unofficial pending tire sampling. Larry Rarer kept his perfect record intact, winning his heat and feature in the Micro Sprints. Rarer was able to get past Rich Livernois Jr on lap 2 to speed away for a convincing victory. It was Livernois’ first start in an open wheel class after competing in stock bodied cars throughout his career. He held second throughout most the race, eventually claiming third. Chris Livernois Jr. and Rarer were heat winners. 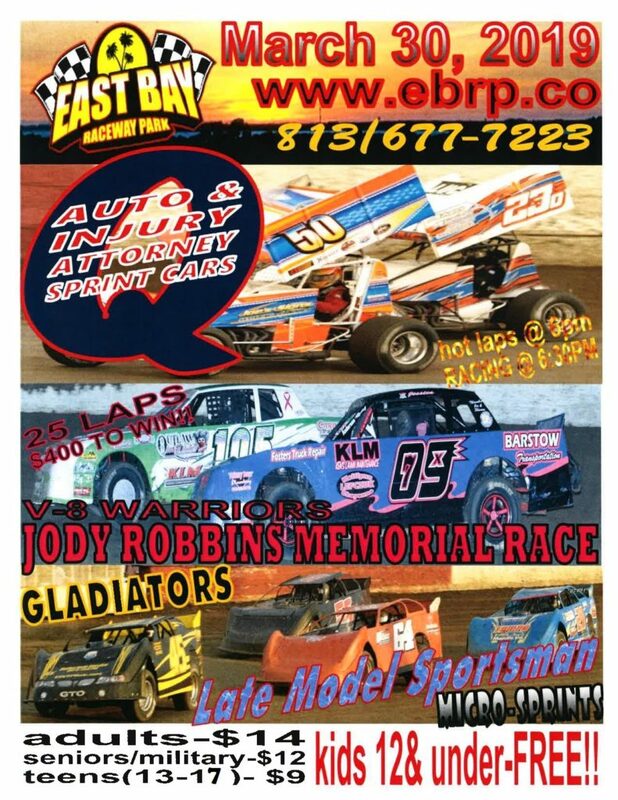 The fifth night of racing in the month of March will come next Saturday, highlighted by the 25-lap Jody Robbins Memorial for V-8 Warriors, Q Auto & Injury Attorneys Sprints will get their first opportunity of the season. 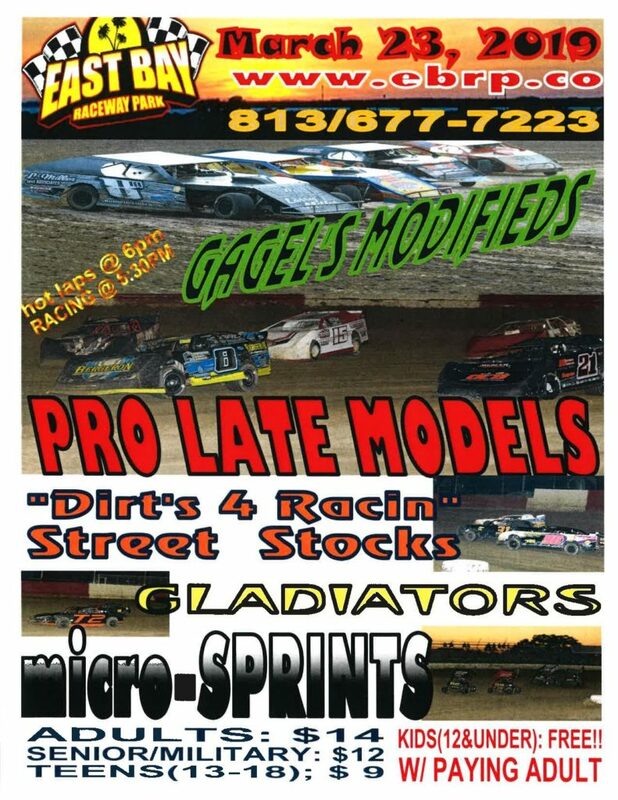 Returning classes include Late Model Sportsman, Micro Sprints and Studio Red Salon Gladiators. Feature: Larry Rarer (97Z), Jerod Meyers (0), Rich Livernois Jr. (17), Paul Seburn (23), Mike Meyers (7), Doug Dyal (97D), Chris Diamond (9), Joe Bartow (3), Corey Dyal (00D), William Burnside (13). DNS – Chris Livernois Jr.
Posted in Uncategorized on March 24, 2019 by admin. Posted in Uncategorized on March 20, 2019 by admin. 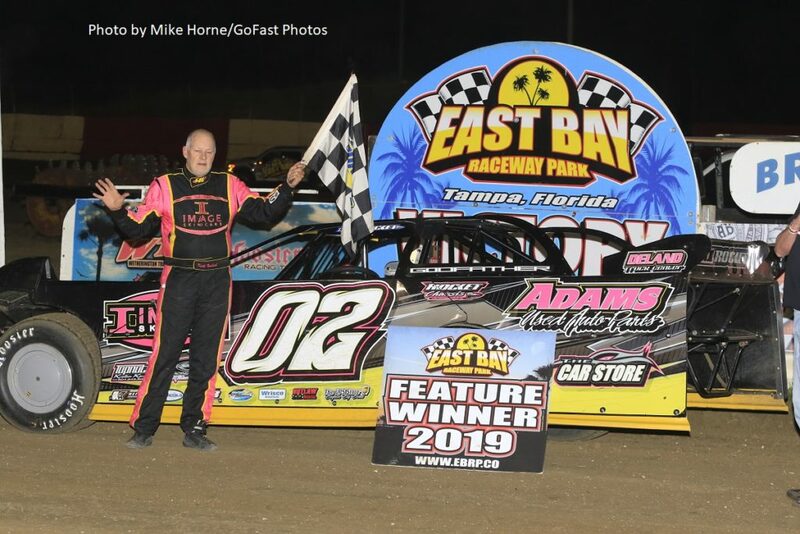 Veteran racer Roger Crouse darted to the outside after an early race restart and took command of the Gagel’s Open Wheel Modified 15-lap, powering on to victory for his first East Bay Modified win in 18 months. Early race leader Eric Moon kept his car pinned to the bottom throughout the early laps until slipping up the track on lap four. That provided the perfect chance for 2018 track champion Bryan Bernhardt, who slipped through for the lead, only to have the pass negated by a caution flag. On the restart, the pass for the lead came from the outside with Crouse making the move. From there, Crouse was never contested, keeping a steady lead over Bernhardt. Billy Howard and Bernhardt opened the night with heat victories. Repeat winners proved to be the theme for most of the remaining classes. Forrest Gough (Late Model Sportsman), Robby Hoffmann (Mini-Sprints) and Kever Raulerson (Studio Red Salon Gladiators) all backed up wins from their division’s opening night with a second visit to the winner’s circle. Gough had to hunt down second-generation racer Tanner Cobb and did so successfully to move out front. Heat winner Jimmy Waldrop appeared to be Gough’s biggest threat, but a mid-race incident took Waldrop out of contention. Cobb recorded his second consecutive runner-up finish. For Hoffmann, it didn’t take long to shoot down the hopes of second generation racer Austin Craddock as Hoffmann swept to the front by the second lap. The closest pursuit came from Zach Amundsen, who turned around the misfortune of the opening night with a strong second. Hoffmann and Joe Askew opened the night with wins in the preliminary. Raulerson capitalized on the misfortune of race leader Bailey Purcell, who tangled with lapped traffic on lap 13 of the 15-lap main. The two front runners made contact, but Raulerson was able to continue, inheriting the lead. A late race battle between Daniel Bowman and Logan Casteel resulted in Casteel, the 2018 Rookie of the Year, crossing for a career best second place. Bowman and Raulerson picked up track points for their heat wins. Gary Lucas made a return to the winner’s circle, claiming the V-8 Warrior main event. The race was a picture of consistency for Lucas, who focused on finding the fast line and repeating it every lap. Heat winner Scott Bane was in hot pursuit, but could not sum up the power to close in on Lucas. Dan Darnell scored the Florida Old Time Modified main after Jamie Frankland was best in the heat. Feature: Roger Crouse (15), Bryan Bernhardt (B69), Eric Moon (18), Austin Sanders (64), Garret Stewart (67), Buzzie Reutimann (00), Drew Jackson (08), Pat Passanise (19), Jimmy Baker (69x), Keven DeVrieze (99), Jerry Bourland (777), Dale Kelley (22), Billy Howard (47). DQ – Kenny Monahan. Feature: Gary Lucas (23), Scott Bane (23B), Jason Burnside (12J), George Handy (105), Justin Meeks (10), Wayne Kissam (07), Nate Whitehurst (07W). DNS – Nick Brown. Posted in Uncategorized on March 17, 2019 by admin. We would like to give our deepest sympathy to the family of Tom White. Tom passed away yesterday (March 15). Tom was a car fabricator and previous driver at several tracks. Please keep his family in your prayers at this time. Announcement for his service will be posted as soon as we receive it. Posted in Uncategorized on March 16, 2019 by admin. Posted in Uncategorized on March 13, 2019 by admin. The second night of the 2019 season saw another five-division program with the Pro Late Models being the only class to repeat. Keith Nosbisch made it two-for-2019 as he backed up last week’s 30-lap Pro Late Model win another stop in Victory Lane Saturday night. Nosbisch was joined on the front row for the main event by Kenny Monahan, who earned the spot with a heat race win. Monahan was in contention until a spin while battling 2018 track champion Phillip Cobb for second. Cobb would go to claim second in the main with Dustin Perez scoring his second straight top five run by claiming third. Nick Hebrank, who competed in the Outlaw 4 class in 2018, stepped into a Street Stock for the first time and made an impressive debut in winning the 15-lap main. Hebrank started last in his heat race and picked up a little experience, then capitalized on that to lead from the start. Heat race winner Mike Wilson had some early race troubles that dropped him from contention. Matt Bozeman powered past Billy Barstow for second on a lap three restart, but could not catch Hebrank. The Late Model Sportsman opener saw 2018 champion Forrest Gough continue his winning ways. Gough, who claimed most of the late season victories in 2018, swept past early leader Tanner Cobb to claim the victory. Gough solidified his point lead for the new season with a heat win. 2019 Winternationals feature winner Larry Rarer needed every lap of the 15-lap main in the Micro Sprints to make a return to Victory Lane. William Burnside was the class of the field until Rarer was abole to chase him down in lapped traffic. Burnside held the lead as the du passed under the white flag, but Rarer ducked inside lapped traffic and gained the advantage. Heats were won by Rarer and 14-year-old Colin Strife, making his first start in a dirt track race. Heat race winners Brandon Yates and Eric Knight battled in an even matchup throughout the 15-lap Outlaw 4 main event. Yates, who won the track championship by four points in 2018, was unable to escape the tenacious attack of Knight. The margin stayed constant lap after lap with the outcome uncertain until the checkered flag came out. 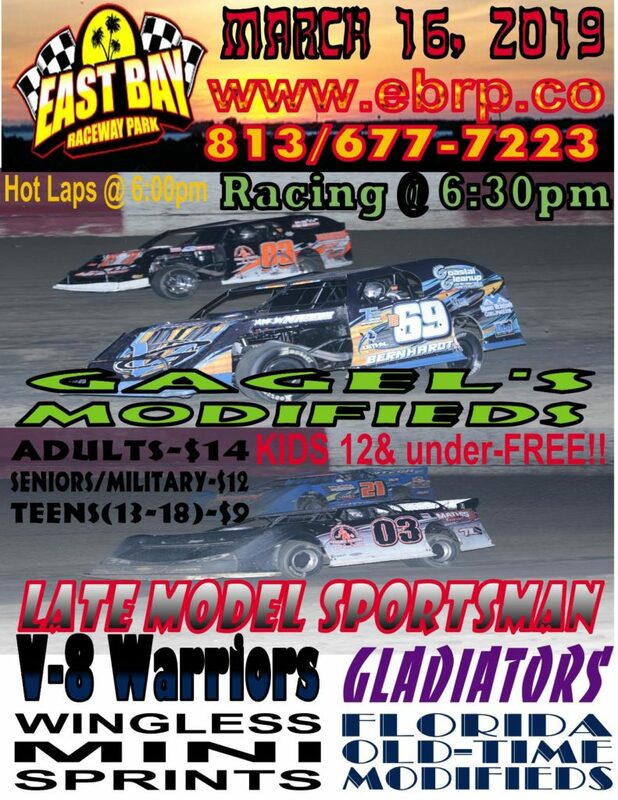 Racing resumes on Saturday, March 16 as the Gagel’s Modifieds, Late Model Sportsman, V-8 Warriors, Studio Red Salon Gladiators, Wingless Mini-Sprints and Florida Old Time Modifieds take the track. Top finishers from 2018 in Wingless Mini Sprints, Gagel’s Modifieds and Late Model Sportsman will be honored. Posted in Uncategorized on March 10, 2019 by admin. 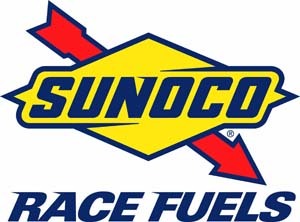 During the regular season, on weeks when East Bay is racing, the Poske location, conveniently located near the pit entrance, will be open Tuesday and Thursday from 10 a.m. to 6 p.m. and Saturday from 1 p.m. to 9 p.m.
Dave Poske Performance Parts is the 2019 parts and Sunoco race fuel supplier for East Bay Raceway Park. Please stop in and see the parts selection. Parts can also be ordered from the Dave Poske Performance Parts headquarters location in Parkersburg, West Virginia. Posted in Uncategorized on March 8, 2019 by admin.